This year was my third time going to GenCon, but in a real sense it was my first time attending. See, my previous two visits I would go down for a day on Saturday and spend most of my time wandering the main exhibit hall. I’d see a few cosplayers, buy a few role-playing books, and that was it. I didn’t spend time checking out new games or playing anything or checking out any of the events available. This year I wanted to get the full experience. I took vacation days for Thursday and Friday so I could spend the day downtown without feeling bad about leaving my wife to handle Things One and Two solo, and I sat down one night to pick out a few events to sign up for each day. This turned out to be a great year to finally commit to the experience too, as one of my favorite authors, Pat Rothfuss, was not only doing some writer’s panels but hosting an hour and a half talk on Friday evening. Plus Harebrained Schemes was doing panels on using the editor for Shadowrun Returns and also I found out shortly before the convention that they were going to be demoing their latest Kickstarter project Golem Arcana (which was quite a bit more fun than I expected it to be). In the end, I actually ended up scheduling too many things to attend and skipping a few in order to play some games and hang out with friends. Speaking of which, I had a great time meeting some Twitter people this year. I spent quite a bit of time hanging out with Winin, walking the exhibit hall and trying out some games including the tile game he’s been developing. I also got to meet up with Ferrel and his wife and try out their Kickstarter card game, Havoc and Hijinks. It’s still going by the way, so if you like cute dragons and fun competitive card games where the person winning can change quickly, I recommend checking it out. It does end on the 24th though so you don’t have much time left. Spending two full days at GenCon plus taking my oldest, who’s four years old, on Saturday really wiped me out. But it was a ton of fun. I’m really looking forward to going again next year, and I’m very excited for when my sons are old enough to really get the full experience. I’d love to make it to one of the PAXes and DragonCon someday as well. 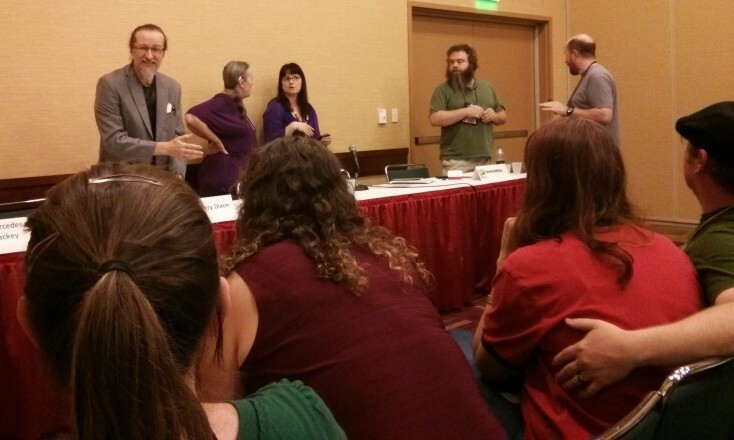 Oh man, I would have loved to check out that Pat Rothfuss panel! It was amazing. I ended up getting there early and was sitting in the front row. The cool thing was, I expected him to be funny and he was, but he was also a much deeper thinker than I realized. It was a really cool talk. Although the writer panels were really good too, the two I went to had Pat in them as well as Mercedes Lackey and her husband Larry Dixon. I’ve never seen Mercedes or Larry talk before but they were hilarious. I added a photo I took of them to the post.